Our lovely church playgroup has been the joyful participant in the FareShare scheme and a local Tesco Express branch donates pastries and breads most weeks which Papa goes to collect and we share with playgroup and church members, with any left over being taken to a local homeless shelter - so there really is no waste! However, the Tesco we receive donations from has apparently had a broken freezer for a few weeks, and the repair is not likely to be swift. So when I received the text to inform me that there was no donation this week, I decided to use some black bananas to whizz up a cake for playgroup instead. I used to bake every Thursday once upon a time, when our playgroup was a small circle of parents and carers, but since beginning online advertising, we've had far higher numbers and I just can't cope with the volume each week! But just this once, I wanted to. Besides, those bananas were going to go to waste otherwise! So I looked for a quick and easy recipe online using the right amount of banana, and then of course I slightly tweaked what I found because it was too high in sugar for my preferences. 1 Preheat the oven to 180˚, and line a 2lb loaf tin with greaseproof paper. 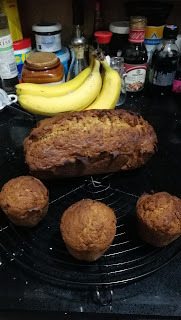 I also used 3 silicone muffin cups as all the mixture didn't fit in the loaf tin. 2 Cream the butter and sugars together until smooth. Beat in the eggs, then the bananas. Add the flour and bicarb, and just stir gently until just combined. Do not over mix. If you are doing the creaming and egg mixing in a machine, stop and use a spatula to fold the flour and bicarb in by hand. 3 Pour into the prepared tin and bake for 30 mins. Remove the smaller cups and turn the loaf around. Cook for another 15 mins and you should find that a toothpick comes out clean by then. Turn out and cool. Slice and share and eat. Sit back and accept the adulation for very little effort. HINTS AND TIPS: The recipe suggests using a 9" x 5" pan. I didn't have anything in even a vaguely similar size so I improvised. It suggested using one whole cup of sugar. I reduced this to three quarters, and would actually happily reduce the sugar further than I did already. It also suggested cooking for 1 hour, but I felt my cake was done perfectly, but I do have a new fan oven.